John Mecray's paintings and limited-edition prints have earned him an international reputation for excellence. Mecray grew up in Cape May, New Jersey, one block from the ocean. He graduated from Philadelphia College of Art, majoring in illustration and painting. He worked as a freelance illustrator before graduating and then taught at the school after graduating. 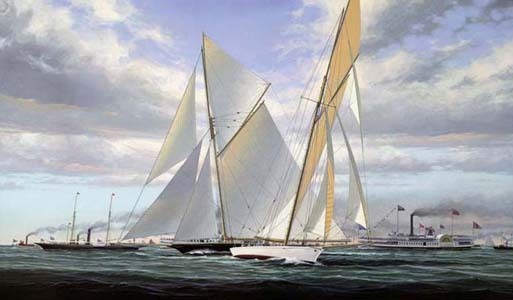 He moved to Newport, Rhode Island in 1976 to devote all of his time to marine painting. Nine offshore yacht deliveries between New England, Bermuda and the Caribbean have given the artist a personal knowledge of the effects of wind, sea, and light on a variety of sailing vessels. A deep interest in yachts and yachting history led Mecray to establish The Museum of Yachting and the museum's annual Classic Yacht Regatta in Newport. He is also founder and trustee of the International Yacht Restoration School, where his major focus is the restoration of the nation's most historic yacht: the schooner Coronet. He is also a member of the Yachting Committee at Mystic Seaport, the New York Yacht Club, the Fort Worth Boat Club, the National Maritime Historical Society, the National Trust for Historic Preservation, and the Herreshoff Marine Museum. 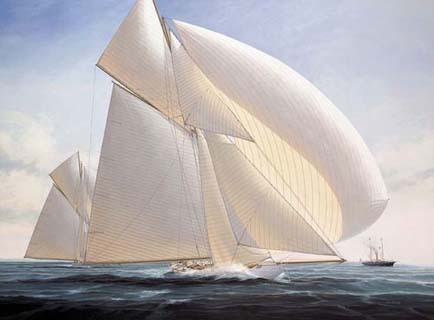 Only 10 yachts were ever built or converted to conform to J-class specifications:.